Who would’ve thought a monster could be so charming, lovable, thoughtful and eloquent— no, not the Sixth Doctor, a Judoon! As a classic Who fan, I haven’t caught up on all of new Who, but this audio makes me want to hunt down the Judoon TV episodes. And yes, I’m well aware that Big Finish’s erstwhile Captain Kybo is an exception to the rule, since this audio also has plenty of typical Judoon lumping about, citing regulations and threatening abrupt and extreme punishments for rules violations. The Sixth Doctor is a perfect foil for them. It’s a stroke of genius to pair up their persnickety love of law with his own hard-won legal experience. 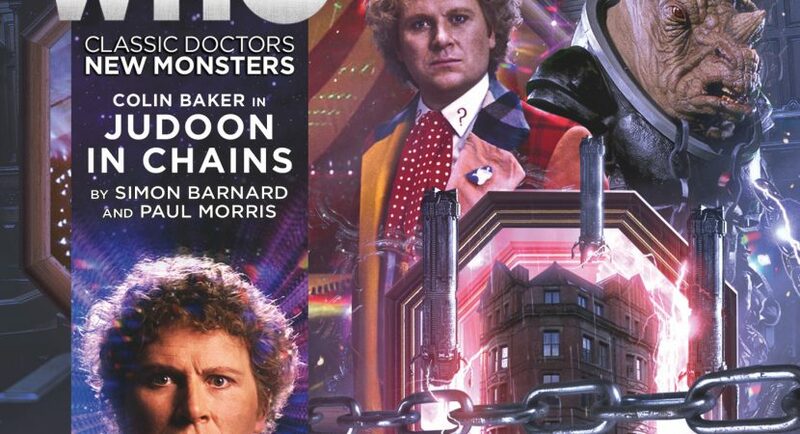 Judoon in Chains has its share of continuity nods to Trial of a Timelord, including stories within stories presented via flashback, allusions to genocide, and gambits within gambits. The Doctor needs all his wits — and one bit of hand-waving, but mostly wits — to stay one step ahead of all the various obstacles and enemies closing around him and Kybo. He’s compassionate, eloquent, snide, clever, and a champion of the downtrodden. Colin even gets to show off his Latin (although I have cause to know he’s even better at ancient Greek). But it’s not all a battle of words. There’s some great settings and moments of action and danger, as the Doctor jumps from space battles to seedy circuses to Victorian courtrooms to alien worlds. Most of all, this story is a surprisingly touching three-hander between the Doctor, the remarkable Kybo, and a sympathetic circus performer, Eliza Jenkins, who takes a shine to the rhino man. It’s a pity her plot has to be tied off early, but there’s so much else going on in this story (with a large and colourful cast) that it’s hard to believe it’s only an hour. It’s not earthshaking, but there’s so many good moments in this story that I had to re-listen immediately just for fun. In a small way, it reminded me of Doctor Who and the Pirates, telling a serious story with a nimble mix of humour, deliberate tropes and canon subversion. I’m not surprised to see this was written by the same team that wrote Aquitaine and several Jago & Litefoot audios. After those I’ve heard so far, Simon Barnard and Paul Morris are going on my list of “oh, this should be a good one” author names I’m excited to see turn up in the summary of a Big Finish audio. One thing gave me pause: an ethical dilemma of a less extreme sort than in Trial of a Timelord. The Doctor winds up infecting and fundamentally altering the Judoon against their wishes, cutting them off from their people and their way of life. The Judoon are terrified; they don’t want to lose their identity. Needs must, and he forces them to it. It’s a rather imperialist and high-handed move, like forcing Donna’s mindwipe against her consent (which disturbed many fans) or like reeducating indigenous peoples against their will, relocating them and forcing them to adopt the beliefs and ways of a more “enlightened” culture— “enlightened” always being defined as ours. He had the best of reasons: self-defense, the protection of everyone in the courtroom (whom he endangered by involving him), and stopping genocide. But it’s still a sticky real-world problem transposed into an SF setting: what gives us the right to decide that people with different mental states or different cultures should be forcibly brainwashed, even when they’re saying they’re happy with who they are?